Stir-Fry Spicy Kung Pao Chicken was my husband’s favorite dish in college. I made this dish several times a week for him and his suite-mates. I’ve been on a spicy kick lately. Just last week, I made Chicken Tacos with Garlic and Chile Sauce, served with fresh jalapenos. Before serving the tacos to my kids, I did remove most of the seeds from the fresh jalapenos. However, this week, I got a little over zealous when I made an authentic Szechwan dish, Stir-Fry Kung Pao Chicken. I give Kung Pao Chicken the credit for luring my college sweetheart into marrying me. It is the one dish I made at least once a week for my husband and his suite mates when we were in college. In fact, one of his suite mates bought me a wok when he graduated, and ended up marrying a sous chef for Aquavit. 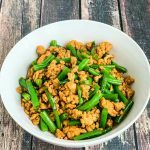 To this day, Kung Pao Chicken remains one of my husband’s favorite dishes, although I haven’t made it in a while. 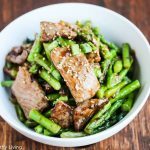 I used to make this dish using hoisin sauce, but most hoisin sauces I’ve come across contain wheat. So, I dug into one of my authentic Szechwan cookbooks and found a version that did not call for hoisin sauce. What threw me was the amount of dried red peppers the recipe called for – 3/4 cups dried red peppers, with the seeds removed. I was doubling the recipe, so that would have meant 1 1/2 cups of dried red peppers. Although I doubled the recipe, I reduced the amount of hot peppers to a still whopping 1/2 cup. 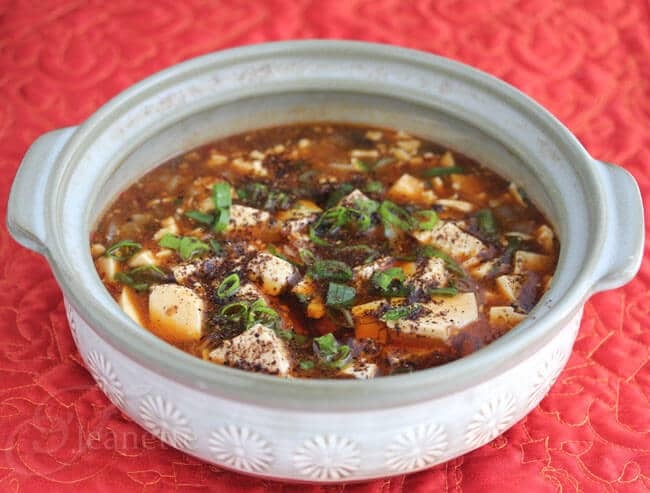 I did want to give this authentic Szechwan recipe a try to get the true experience since Szechwan cooking is known for its spiciness. To make this a one dish meal, I added fresh shitake mushrooms, snow peas and red bell peppers to this chicken stir-fry dish, and served it with steamed brown rice. Instead of the traditional peanuts that this dish is topped with, I opted for pan toasted heart-healthy walnuts. As I sauteed the hot peppers and Szechwan peppercorns, I used my better sense and removed them from the pan instead of cooking the chicken with the chili peppers. Thank goodness! Wow, this dish was hot. I think it is the spiciest dish I’ve eaten since the Szechwan Fish Casserole I had last year in New York City. Let’s just say that when I served this for dinner, along with another traditional Szechwan dish, Ma-Po Tofu, that everyone’s mouths were on fire and there was a lot of water being gulped down in between bites. I put out a bowl of grapes to quell the heat (I don’t think I’ve ever seen my boys gobble down grapes that fast!). My kids thought the flavor was really good in both of these dishes, but it was way too hot. My youngest son actually tolerated the heat better than his older brothers, and my husband, who is not a huge spicy food fan, loved it although he also thought it was too spicy. Next time, I will stick to the 3-4 dried hot chili peppers that I typically use when I make Stir-Fry Kung Pao Chicken. (Rest assured, I have modified the amount of chili peppers in the recipe below ;)). This past week, I read a restaurant review by Gael Greene from a few years back when she visited Cafe China, a Szechwan restaurant in Manhattan. One of the dishes she ordered was Kung Pao Chicken, which she described as “powerful, pocked with fiery ma chilies, peppercorns and peanuts.” So, I thought I would honor her by making Kung Pao Chicken this week since she is being recognized as one of 50 Women Game Changers in Food. A group of food bloggers has been making its way through the list and we are on #46 already. So, who is Gael Greene? Gael Greene was a restaurant critic for New York magazine’s Insatiable for 40 years before being dismissed in 2008. Upon her dismissal, Glenn Collins wrote (in a New York Times article), “But even among those who might have seen it coming, many were taken aback at the expulsion of the sensualist who influenced the way a generation of New Yorkers ate, and who served as a lusty narrator of restaurant life in New York for decades.” Gael Greene was known for appearing incognito at restaurants by wearing her trademark hats. According to Gael Greene’s own account (on her blog Insatiable Critic), “A scholarly anthropologist could trace the evolution of New York restaurants on a timeline that would reflect her passions and taste over 30 years from Le Pavillon to nouvelle cuisine to couturier pizzas, pastas and hot fudge sundaes, to more healthful eating. But not to foams and herb sorbet; she loathes them.” Her work along with photographs by her partner, Steve Richter, professional street photographer, has appeared in Travel & Leisure, Food & Wine magazine, Departures and Food Arts as well as in special travel features in New York Magazine. Today, Gael Greene continues to critique restaurants on her blog). Gael Greene and James Beard co-founded Citymeals-on-Wheels, to help feed the city’s frail homebound elderly. She has received numerous awards for her work with Citymeals and was honored as the Humanitarian of the Year (l992) by the James Beard Foundation. She is also the author of a memoir, “Insatiable, Tales from a Life of Delicious Excess” which was published in April, 2006. In addition, she has written two earlier non-fiction books and two novels, both of which were New York Times best sellers. 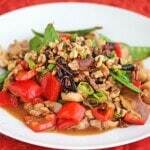 I’m looking forward to making Kung Pao Chicken again soon, next time, taming the heat a bit. Adapted from Lee Hwa Lin's Szechwan Style Chinese Cuisine cookbook. The original recipe calls for a technique whereby the chicken is cooked in low-heat oil (4 cups of oil). I changed this to a stir-fry to make it healthier.Also, I significantly cut back on the amount of red chili peppers. 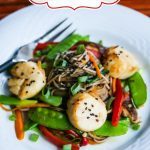 To make this a one dish meal, I added red bell peppers, snow peas and mushrooms. Use whatever vegetables you have on hand. All you need is some steamed brown rice to complete this meal. Mix Chicken Marinade together in a medium bowl. Add cubed chicken pieces and toss well. Let sit for 10-15 minutes. 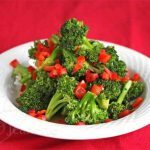 Meanwhile, lay out Stir-Fry Ingredients on a cutting board, and mix together Stir-Fry Sauce in a small bowl. Heat 1 teaspoon oil in a wok. Add red bell pepper strips and snow peas and stir-fry one minute. Add shitake mushrooms and stir-fry another minute. Remove from wok and set aside. Top with toasted walnuts before serving. To make cutting the chicken easier, partially freeze. Then cut chicken into 1/2" strips lengthwise, then crosswise. I adore kung pao chicken, and always wish the restaurants would make it spicier! So you can send those too-hot leftovers to me. 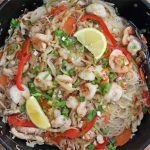 I use a recipe from a Chinese cookbook I bought in Malaysia years ago. Now I’m going to try your recipe and compare. Lydia – I can’t even tell you how hot this was! I loved it but I would definitely tone down the chilies next time. 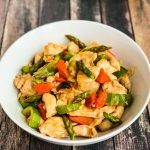 I would love to try your kung pao chicken – would be fun to compare the two. 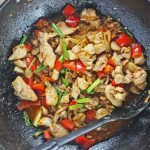 Fantastic stir fry – I’m a big fan of spicy dishes and this one is so colorful! 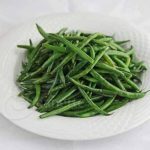 I love this dish and am fussy – love it fresh and not with sauce that has been sitting around for days. This is a perfect way to honor Green! A great way to represent Gael Greene…very interesting post! I’m not crazy for very spicy foods, but love kung pao chicken. Yours looks delectable! I bet this was popular at your house! Looks great. Thanks Mary – there were not too many recipes by Gael Greene, but since she was a restaurant critic, I thought this would be a nice way to explore her experience. Wow, both of those dishes look awesome. Where was this post when I was adding recipes to my weekly menu last night? I love spicy, but I’m with you – not so spicy that I have to mute the heat while I eat it. Oh, that is a lot of chiles…but I bet my oldest and the hubs would adore as-is. It definitely looks amazing! Although Gael is not a chef she sure knows how to eat! Kang Pao chicken is also my husbands favorite dish and I haven’t made it in a really long time, either. One time—a long time ago—when I was making it, I put the chilis in the oil and it was too hot, smoke started rising and my husband and I started coughing and had to run outside to breathe. The poor cat stayed in the house and then she started coughing and figured out why we ran out, and then she escaped the inferno, too. Ah… the memories. I’ve got to make it again soon. I am not the one who likes to express my prowess by eating overly hot dishes but if I cut back on the spice I am sure this would wow me!! 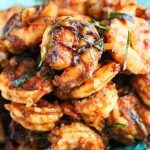 I am definitely going to tame the heat next time I make this – going back to my normal 3-4 dried chilies that add just enough spice but not too much. These 50 women game changer posts are always so interesting. Love the look of both the chicken and the tofu! 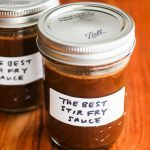 I love that you found a recipe without hoisin. I’ll definitely give this a go (with a little less spice tho). The walnuts are a nice touch!. 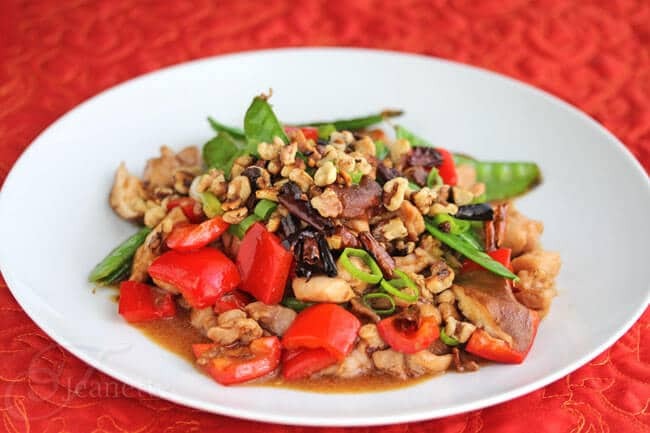 Your kung pao chicken looks delicious, but sounds way to spicy for us! Wasn’t Gael a fun study this week? Erin, so glad to hear you tried this recipe and loved it. It is a dish I’ve been making for years, and remains my husband’s favorite. 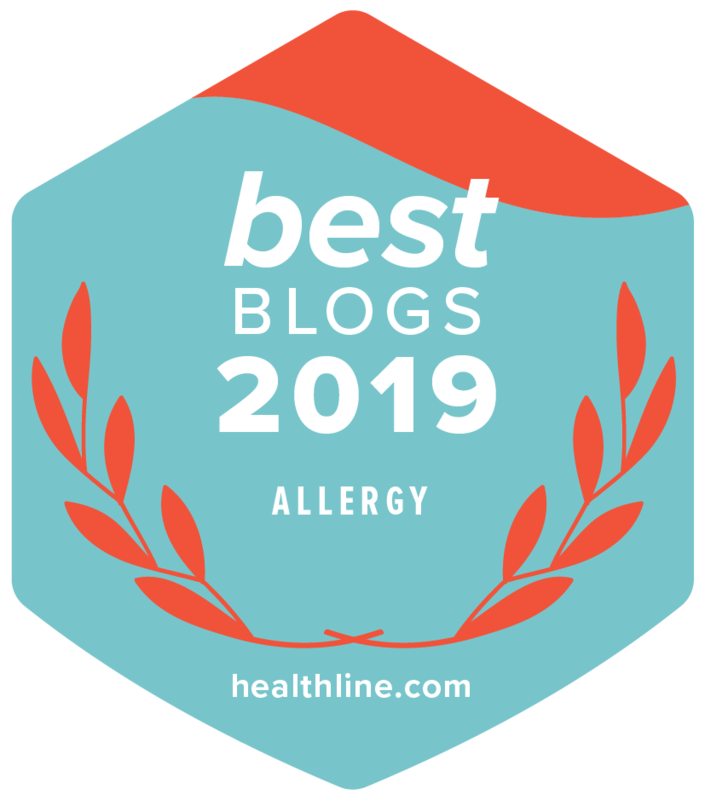 Congratulations to the best healthy living website created by a talented woman for her family, friends and the public at large. We appreciate the hard work you put into this venture and we wish you continued success. Just made this. It was delicious BUT NOT spicy! I couldn’t find Szechwan peppercorns but I found out Penzy’s has them for the next time I make it. I bought dried Asian chili peppers at the Japanese market and they just weren’t hot. What brands do you recommend? Thank you Jeanette. Marry – so glad you enjoyed this. THe Szechwan peppercorns will add some heat to this. You might try some of the dried chili peppers from Penzeys. They have a heat scale in their catalog so you can choose a pepper variety according to your preference of spiciness. Asian chili peppers are not labeled so it’s difficult to tell which ones are hot. The ones I use from our local Asian market happen to be very spicy.